With the invitation to follow Christ, Son of living God, born on the earth on the wood of a cradle, born in the heaven on the wood of the Cross. Fifth Sunday after the Martyrdom of St. John the Precursor. The Gospel passage doesn’t consist of two parts juxtaposed, one regarding the announcement of the Passion of Christ and the other one the training of the disciples. It is a unique and coherent speech that we can name “The Cross of Jesus and its consequences for the disciple”. To become the servant and to welcome the children in his name are two behaviors that Jesus gently and decisively teaches his disciples and that must be “practiced” together. To practice these two behaviors is to imitate Christ, following him to the Cross as He did, and to be like Him servant of all. “If anyone wants to be first, he shall be the last of all and the servant of all” (Mk 9, 35). From the day when the Son of God took flesh and entered our history, going a long way from the cradle of Bethlehem-which was a path of offering (= a way of the Cross) that culminated in the “cradle” of the Cross on Mount Calvary in Jerusalem- the criteria for judging the value of the human person and dignity have been radically overturned. The dignity of a person is not the place he occupies, the work he does, the things that he possesses, the fame he reaches. The greatness of man lies not in what of consequence he does, but in service to God and men for the manifestation of the glory, the goodness and the love of God. The privileged way of this service is welcome. St. Mark uses the word “welcome” on several occasions and with different nuances, but all somehow converge. The Evangelist speaks of hospitality for the missionary (6.11), the Word (4.20), the Kingdom (10:15), the children. To welcome means to listen, to make oneself available, and to accommodate the Infinite that has become a Child and the children that in the cradle reflect the sky. To welcome therefore means above all to let be “surprised” by the Word, by the missionary or by the children, and the ability to be at their service. Today Jesus teaches placing in front of the disciples the sign of a child. He embraces it because it is his sign. He is the sign of the Father who sent Him and the child is a sign of God’s tenderness and of the filial obedience of His only child who for love became a Child and for obedience was crucify with the wrongdoers. It is a small child, but it is a sign of Him who is from God. The words he speaks (“Whoever receives one child such as this in my name receives me, and whoever receives me, receives not me but him who sent me” Mk 9, 37) are loaded with great revelation. The child placed in the middle and embraced is at the same time the image of Christ, the image of the Christian and the image of God. To accept the child in the name of Christ is to receive the mystery of God. Today’s Gospel is a strong teaching on the humanity of the Son of God. Jesus says that he is the Son of man. His death and resurrection are concrete and true things. And then there is that speech in the house when the Lord finds himself with his disciples, his “new” family, holy or better on the way to holiness. He does not rebuke them, but explains to them the new way of being the first: to welcome the child is to welcome him and the Father. The disciples find it hard to understand that following Jesus means to deny oneself and take up his cross and they’re afraid. We also have fear to understand. Our not understanding is a not wanting to understand. That child embraced and put in the middle is the sign of the mystery of God who gives himself in the hands of man. The welcome of the “children” is the test of the authenticity of our service and our hospitality toward the Infinite who became a Child for us. It is on the cross that Jesus was born to Heaven and the Virgin Mary who had given birth without pain, the Mother of God,” gave Him Light” by agreeing to suffer much more than the pain of childbirth and accepting us as her children in her Son. This “Mater dolorosa” who stood firm under the cross is the Virgin of virgins, who follow her imitating her motherhood. These women by imitating Mary are mothers in spirit because of the complete gift of themselves to Christ. In an eminent and unique way, Mary gave her body and blood – that is, all her life – so that they might be the body and blood of the Son of God. The Virgin Mary was the mother in the fullest and most profound sense of the word: he gave her life to the Other, and ‘blended’ her life in him. She accepted the only true essence of all creatures and of all creation: to put the meaning and, therefore, the fullness of life in God. Mary’s virginity was fullness and totality of love. It was not a ‘ denial ‘ of love. It is the totality of the gift of Mary to God and, therefore, the true expression, the true quality of his love. The Mother of God and our mother showed and still shows that motherhood is the fulfillment of femininity because it is the fulfillment of love as obedience and response. It is in the offering that love gives life and becomes a source of life. The joyful mystery of Mary’s motherhood is thus not opposed to the mystery of her virginity. It is the same mystery. She is not mother ‘in spite’ of her virginity. Indeed, this reveals the fullness of her motherhood because her virginity is the fullness of love. The consecrated Virgins testify that this motherhood is still possible, with simplicity, faith, and devotion. In fact, it is the fullness of love that accepts God’s coming to us, giving life to Him who is the life of the world. Let us appreciate, rejoice and recognize that the consecrated Virgins witness that the end and the fullness of all life and of all love is “to accept Christ” and give him life in us. Bede: This ignorance of the disciples proceeds not so much from slowness of intellect, as from love for the Saviour, for they were as yet carnal, and ignorant of the mystery of the cross, they could not, therefore, believe that He whom they had recognized as the true God, was about to die; being accustomed then to hear Him often talk in figures, and shrinking from the events of His death, they would have it that something was conveyed figuratively in those things, which He spoke openly concerning His betrayal and passion. But Luke says (ed. note: Lc 9,46, Vulgate) that “the thought entered into the disciples which of them should be the greatest;” for the Lord laid open their thought and intention from their private discourse according to the Gospel narrative. 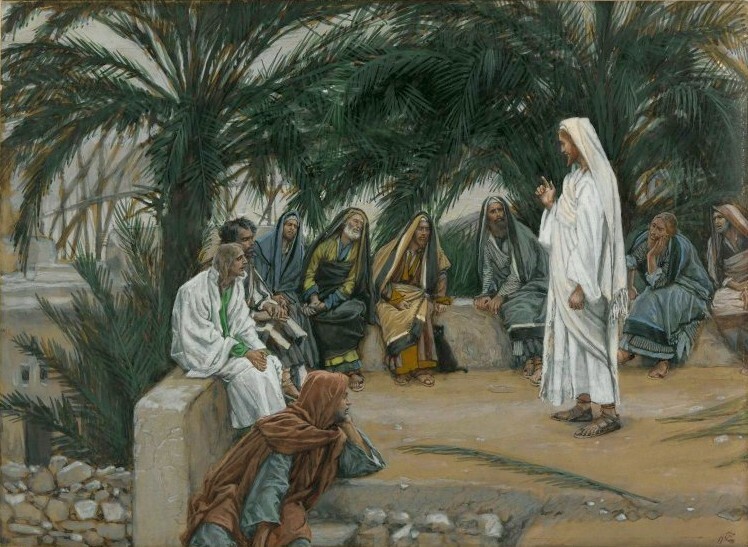 Bede: The reason why the dispute concerning the chief place arose amongst the disciples seems to have been, that Peter, James, and John, were led apart from the rest into the mountain, and that something secret was there entrusted to them, also that the keys of the kingdom of heaven were promised to Peter, according to Matthew. Seeing, however, the thoughts of the disciples, the Lord takes care to heal the desire of glory by humility; for He first, by simply commanding humility, admonishes them that a high station was not to be aimed at. Pseudo-Chrys., Vict. Ant. e Cat. in Marc. : The disciples indeed wished to receive honor at the hands of the Lord; they also had a desire to be made great by Christ, for the great a man is, the more worthy of honor he becomes, for which reason He did not throw an obstacle in the way of that desire, but brought in humility. Chrys., Vict. Ant. e Cat. in Marc. see Chrys., Hom. in Matt., 58: By the very sight, persuading them to humility and simplicity; for this little one was pure from envy and vainglory, and from a desire of superiority. But He does not only say, If ye become such, ye shall receive a great reward but also, if ye will honor others, who are such for My sake. Bede: By which, He either simply shows that those who would become greater must receive the poor of Christ in honor of Him, or He would persuade them to be in malice children, to keep simplicity without arrogance, charity without envy, devotedness without anger. Again, by taking the child into His arms, He implies that the lowly are worthy of his embrace and love. He adds also, “In My name,” that they might, with the fixed purpose of reason, follow for His name’s sake that mold of virtue to which the child keeps, with nature for his guide. And because He taught that He Himself was received in children, lest it should be thought that there was nothing in Him but what was seen, He added, “And whosoever shall receive Me, receiveth not Me, but Him that sent Me. ;” thus wishing that we should believe Him to be of the same nature and of equal greatness with His Father.